Everyone is gearing up for epic Thanksgiving cookery right now, which marks the beginning of the upcoming holiday season marathon of roasted turkeys, mashed potatoes, and gluttony galore. In case you're looking for last minute Thanksgiving desserts: might I recommend a drunken pear frangipane tart? or pumpkin pie with caramel brandy hard sauce? (Wait, why did those first two suggestions both involve liquor???) Or, for a twist on a traditional favorite, cheddar apple hand pies? Sometimes during the holiday season, though, I get tired of all the insane hubbub of endless buffets and fancy eating and zipping from place to place. Sometimes, I just want to slow down, take some time, stare out the window at the crisp winter days, wrap my hands around a mug of tea or hot chocolate or warm apple cider or milk while sitting by a cozy, crackling fire, listen to my favorite Christmas music, and just enjoy the holiday season and the twinkle of the Christmas lights reflecting off of the walls. 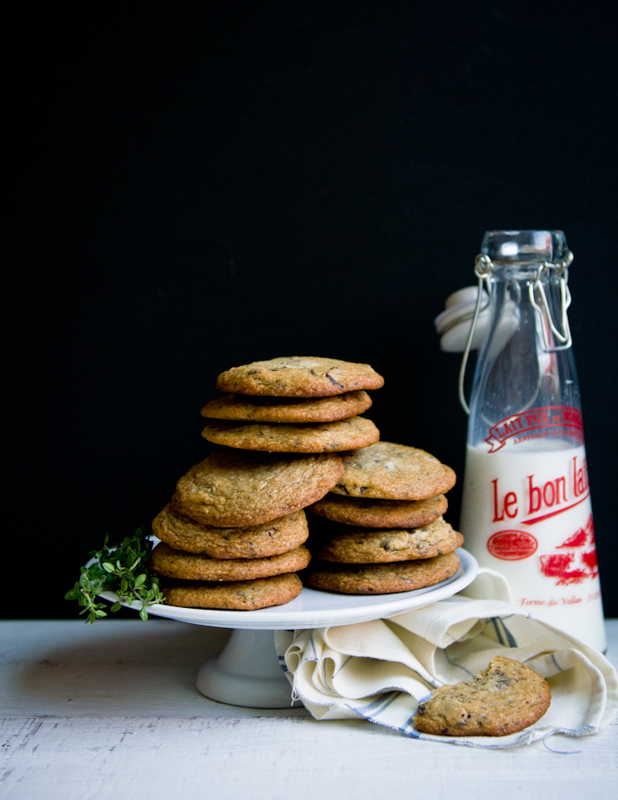 For those days, this is the cookie you'll want to nosh on: seasalt and thyme chocolate chunk cookies. Have a very happy Thanksgiving, everyone! 1. Preheat oven to 350 degrees F. Prepare sheet pans lined with parchment paper or silpats. 2. In a bowl, whisk to combine the bread flour, all purpose flour, baking soda, salt, and fresh thyme leaves. Set aside. 3. In a mixer bowl with the paddle attachment, cream the butter for about 2-3 minutes. Scrape down sides of bowl as needed. 4. Gradually add the brown sugar, white sugar, and molasses to the butter, beating until light and fluffy. 6. Mix in the dry ingredients and then fold in the chocolate chunks until well-distributed. 7. Form each cookie using about two tablespoons of dough per cookie. Roll into a ball and place on the prepared pan, pressing down slightly to form a thick disc. Leave room between each cookie--they will spread. Sprinkle a small amount of sea salt on each cookie and mist gently with water before baking. 8. Bake for 12 minutes, rotating the pan halfway through the baking time, until the edges of the cookies are just turning brown. Remove from the oven and let cool on the pan on a rack for two minutes before removing the cookies from the pan and cooling directly on a rack. Interesting combination. 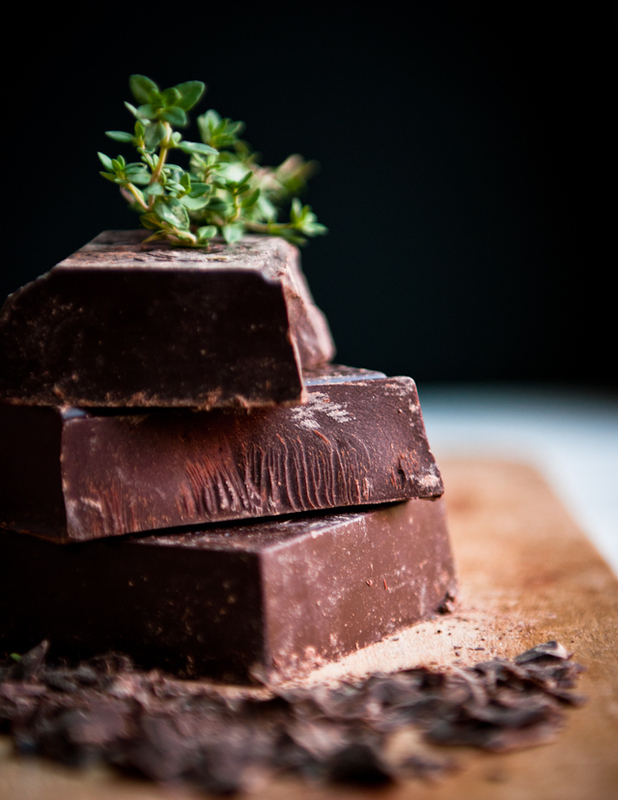 Thyme and chocolate, I do want to try it now. Got TK's Ad Hoc at Home recently and haven't made anything from it. This will make a perfect Christmas gift! I just LOVE chocolate and Thyme combination!! !It's my favourite! Plus, as Chang thinks, it's a perfect gift!!! What a gorgeous combination! I've used rosemary in sweet cooking before but not thyme so would love to give these a go. Chocolate chip cookies are heaven, but sometimes it's important to mix it up and try new flavours. Yum. Yum! I'm definitely making these for my family when I go home for Thanksgiving this weekend. Is the misting to make them brown more? I never thought of that! What a neat take on the chocolate chip cookie. I'm very intrigued. 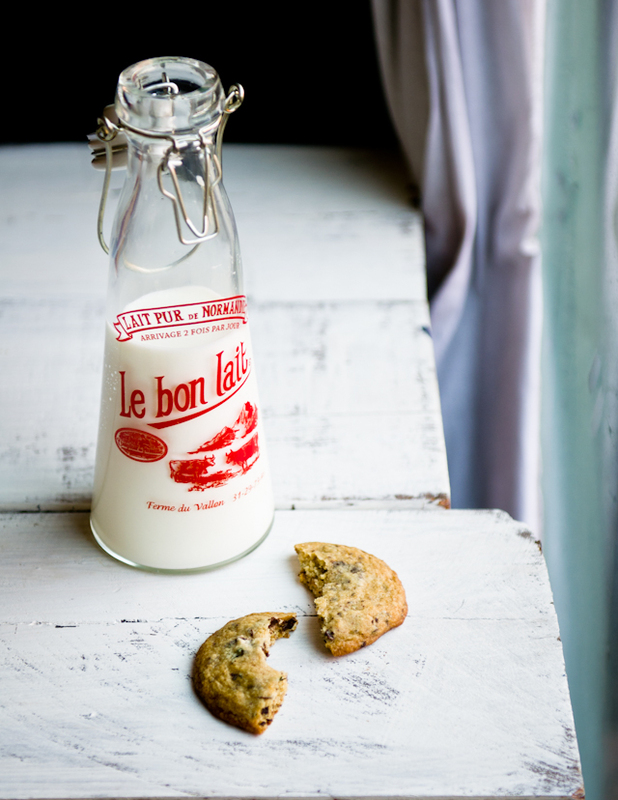 Chocolate chip cookies are a staple around here so I think the next batch will be this recipe. These cookies sound very interesting. I like the idea of a "grown up" chocolate chip cookie. Your photos are SO amazing. If you were to do a series of Christmas greeting cards, I would definitely buy them! I read somewhere recently that the element of surprise and delight can only be experienced when the cook (or baker) experiences it as well. It's trying recipes like these that keeps us excited and interested in baking, which is passed on to those we share our goodies with. Can't wait to give this recipe a try! Oh my Goodness these look way too devine! I LOVE mixing up herbs into chocolate deserts...I do a great Cardamom Brownie but have never thought of Thyme! I am looking forward to trying these out! Thank you for sharing the wonderful recipe! Wow, you are a genius! I love the salt and chocolate combination, but I've never thought of adding an herb like thyme. 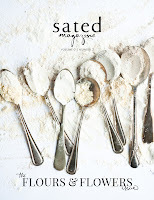 This is going on my holiday baking list right now. Yum!! Very surprising combination, but I know chocolate and thyme are good friends ! Your photos are beautiful! absolutely beautiful shots... and a very intriguing combination of flavors. thanks for sharing! happy thanksgiving! Thank you, thank you. We're on a total thyme kick right now (the thyme plants in our herb garden this year did amazing, and we've still got handfuls of dried sprigs waiting to be used). 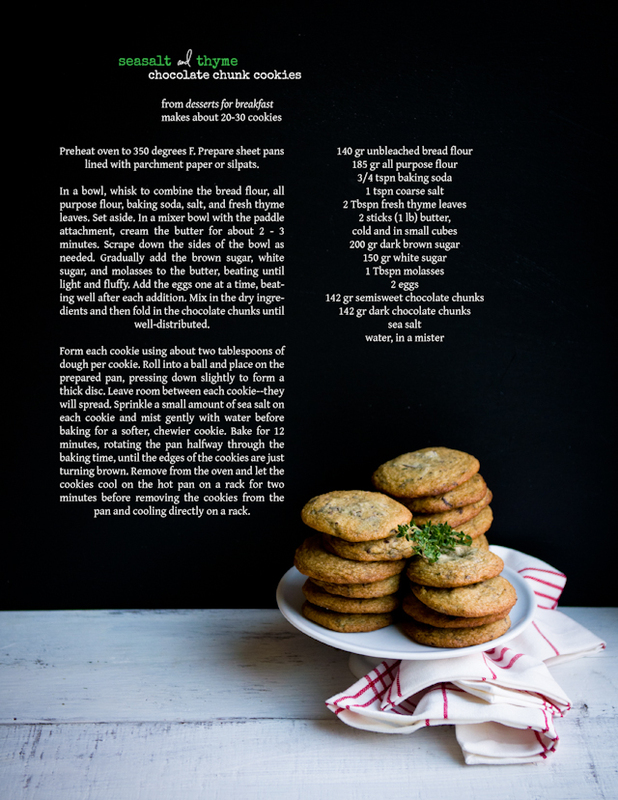 We're often starting our day with thyme lemon scones for breakfast, and now I imagine we can end our day with these cookies! That last photo is so gorgeous! I have to try these cookies. I love your props! Where do you get those? I'm sure you hear this all the time but I have to say your images are breath taking! I am so glad I happened upon your blog this morning, what a feast for the eyes with so many wonderful creations! 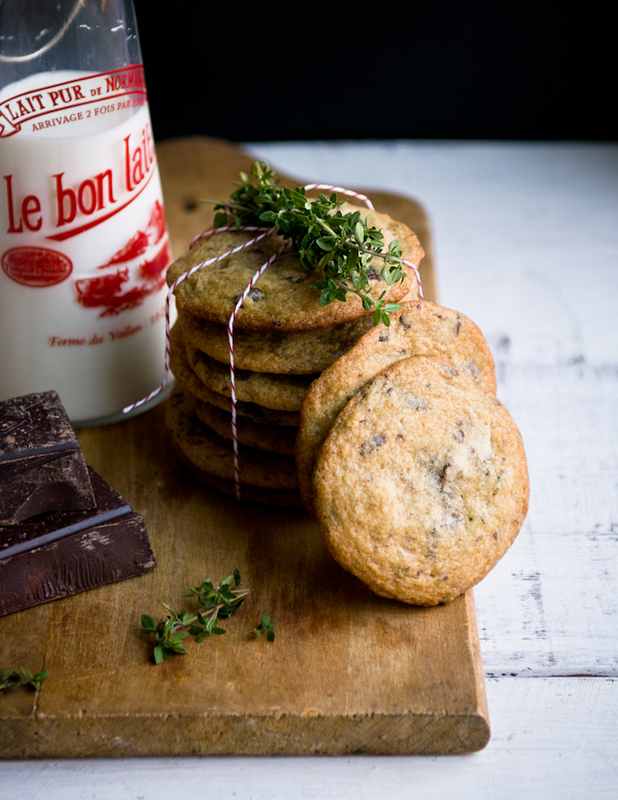 Thyme is an interesting twist on the traditional chocolate chip cookie. These look divine I have to try these - maybe a new christmas cookie recipe! I kind of need to have some of these cookies in my life ASAP. 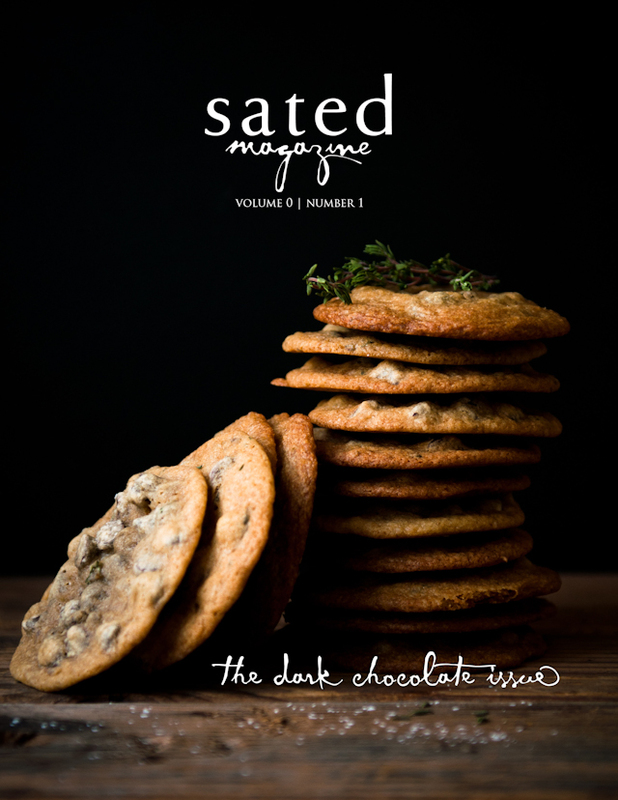 Thyme, salt, and chocolate? Genius! Thanks for the post! Wow. I am going to be baking a batch of these soon. I can just imagine the flavors - I am already in love!